A cozy Rag Wreath adorned with wooden buttons and handmade ornaments – what a perfect way to kick off the Christmas season! 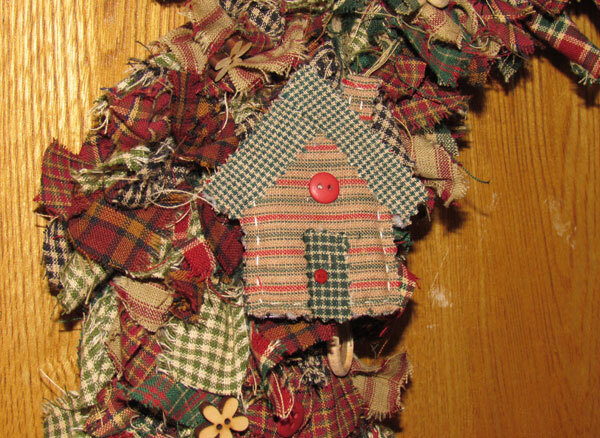 Hang it on a door, place it on your mantle, or tie it to a banister to add a homespun touch to your home this winter. It’s fairly easy to make a wreath like this one (and even easier to buy one on sites like etsy.com), but one lucky blog reader will win this handmade Homespun Rag Wreath from Jubilee Fabrics. To enter the giveaway, simply leave a comment on this post by Tuesday, November 27th. One winner will be randomly selected and notified via email the following day. This Rag Wreath would make a great Christmas gift or hostess gift! Or keep it for yourself and pass it down to your children or grandchildren as a unique heirloom piece. Thank you so much rags-n-rhinestones! I cannot wait to hang this up on my door for Christmas! You’re very welcome! Thanks for visiting the blog. And God Bless and Merry Christmas to you too! LOOOOOOOVVVVVEEEEE IT!!! So original!!!! I would love to have the patter for this!! Good job!!! Thanks Karine! You can find simple instructions for making rag wreaths on our Weekend Projects RAG WREATH page! Would be perfect on my door at school/ LOve IT! This wreath is so so pretty. I love country and Homespun Fabrics. I have made a yoyo string garland for my tree from your squares and it is so pretty on my country tree. Congrats to the winner and I hope that’s me. 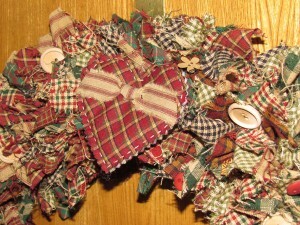 I am submitting my contact information to enter the Rag Wreath Giveaway contest. I love your website and products! I will be making my first rag quilt this winter with your homespun fabrics! I am so excited! I absolutely love all of your ragged homespun ideas. I want to thank you for the opportunity to win such a beautiful wreath. Happy Holidays and good luck to all who have entered to win. Oh I hope I am not too late to enter your giveaway. I only just discovered you! Great products. The wreath would look even more beautiful on my front porch door!! I started to make one of these but ran out of patience!! So I made yoyo’s instead with my homespun fabric! This is the most beautiful rag wreath to date. I am going to try and win this one, but am going to follow your instructions to try and achieve making one. Glad for Jubilee Fabrics…I am Rag Crazy!!! I am so glad I found this company to purchase homespun fabrics. This wreath would look great in my home or a nice gift for someone. This is so pretty. Someone did a fantastic job! Thank you for giving us all an opportunity to win it. Merry Christmas! Thank you for the opportunity to win this beautiful wreath! Love this wreath. I already have the ornaments and would love to have a wreath for the wall. Merry Christmas! What a welcoming wreath! I just love homespun materials and how they look used in crafts. Thank you for the opportunity to win one! Aww! Congratulations on your first grandchild! Welcome to the world, Baby Cooper! I really love this idea for the rag wreath. Already have materials to make one for myself! Love the ragged wreath. I would love to have this hanging on my front door when my family comes to visit at Christmas. I enjoy seeing all the new projects on your site. Thanks for sharing. This is a beautiful wreath and a fine example of what homespun charm is all about. Thank you for the opportunity to win. What an awesome addition over my fireplace for a Country Canadian Christmas. The colors are lovely, and it is something I would never tire of. I could win the office door decorating contest at work with this wreath!! Love the wreath and your site. Looking forward to trying many projects. It is a great wreath and I would like to make some for my girls! Would look great with my decor…..I love it!!! So glad I came upon this website recently. So looking forward to receiving the items I’ve ordered and how wonderful is this wreat?! Anyone would be lucky to have this. This is a beautiful wreath. I would love to have it and make some for my family and friends. I love all of your items. i have ordered from you before and plan to order more in the future. i especially love the rag wreath. someone gave my sister one a few years ago and it is absolutely beautiful. I would really love to hang the wreath on my front door so everyone can see. It would be a beautiful addition to all my holiday decorating. I hope you and your family have a safe and happy holiday. I love working with the homespun fabrics and would be proud to show this beautiful wreath on my front door. Whoever wins it will be a very lucky person. I must say that is so cute. You girls are so talented. I love this wreath! Beautiful!!! 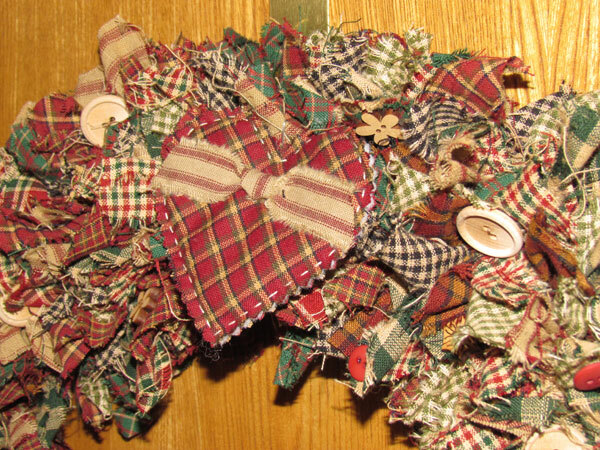 Love this Rag Wreath. It would look stunning in my home. I love your fabric I bought. I wish I could find the christmas red with black plaid to use. I love the wreath, is this made from one of your charm packs? I would like to make some for xmas presents. 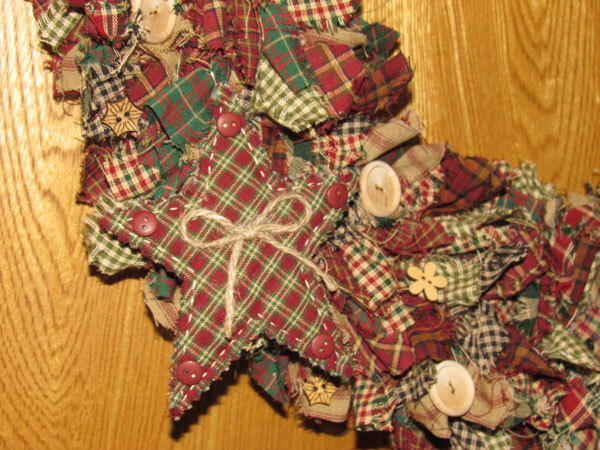 You can find simple instructions for making a rag wreath like this one on THIS PAGE. This wreath would look great on our newly restored log cabin. It’s getting about time I made another rag quilt, made for everyone else except myself. Just made some rag placemats from homespun purchased from Jubilee. They turned out perfecy. The wreath would surely match them! This is such a cute wreath!! I would love to win it!! Please enter me in your giveaway. Thanks so much!! 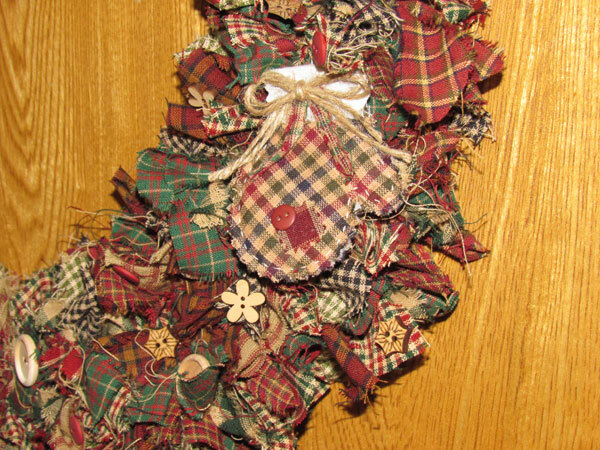 The Rag Wreath would add charm to our farm house front door. Very beautiful and makes you feel welcome just looking at it. I am working on the sweetheart rag quilt that I purchased from your website. I love this fabric. This wreath is beautiful. Thank you so much for the opportunity to win one. I still have the perfect spot for this gorgeous wreath! This wreath is absolutely gorgeous – really want to have it to hang this xmas! So looking forward to a homespun Xmas at our house with my 3 kids& my darling 3 little grandsons who are age 2 — 19 months & 18 months! Will be a fun fun Xmas with them – love making our home feel homey and cozy with primitive homespun look – sure hope I win this! Love the Rag Wreath, it is beautiful! Love all my fabric that I have purchased from you. Will continue to be a customer. I love this wreath, have a few questions. How many strips did it take to make this beautiful wreath? Are those wooden buttons? Keep up the great work, I love it all. You can find simple instructions on THIS PAGE. And yes, the buttons are wooden buttons from our button inventory. You can view all of our buttons HERE. Very pretty and a great idea! I wonder how it’s made? You can find simple instructions on THIS PAGE. I love this!!! If I don’t win I will be making one for myself. Hope everyone had a blessed Thanksgiving! I love this in my new home it would look very wonderful on the fireplace. But if i did win it look to make one, for myself.. I am so glad I found your website. I love the homespun, country style of quilts and Christmas ornaments. It reminds me of the “old day”, and it makes me feel good just to look at the beautiful country colors. I am a “quilter wanna-be”. My sweet husband bought me a beautiful Bernina sewing machine, and I have stacks of beautiful material. But I’m still intimidated to try to quilt on my own. I’ve seen the rag quilts before, and I want to try making one of those. The instructions and examples on your web site are wonderful, and I am more confident now that I can make my own rag quilt. I’m also going to make country ornaments like you have on your web site. Thank you for your website, and for the encouragement it gives me to take the big step and try to quilt on my own. OMG, would love to win this, I think it is beautiful. I love this wreath. I’m totally addicted to homespun. Just cant get enough of it. Would love to have this wreath. Thanks for the opportunity. This is beautiful….would love to win it! Would love to win this beautiful Christmas wreath. This is gorgeous!! Would LOVE to win this! Second best would be to find the pattern! Will it be available to purchase soon? Very cute wreath! I’m happy to have found your homespun fabrics at a reasonable price. Thank you. This would fir in with my style…..love homespun. Can’t get enough of it!!! Esta preciosa y como no querer tenerla colgada en mi puerta en el sur de Chile, de no ganarla tendre que hacerme una…EN LO SIMPLE ESTA LO BELLO. This is adorable and looks like it was a lot of work. Who wouldn’t love this in their home? I love your company and I love this wreath. I have a log cabin and would love to win this to display on my door, just love it! 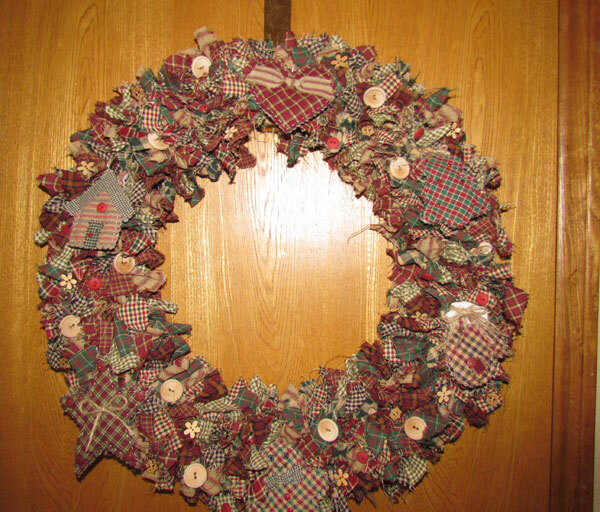 This wreath is “homespun”!! very festive and creates a feeling of a time when things were less hectic!!! Love, love, love this wreath! I have made similar ones, but this one inspires me to do mine different!! I absolutely love this wreath ♡. I’m thinking I might have to make one! What a lovely wreath. I just finished my first rag quilt with your fabric. It turned out just right. My son loves it. Thank you! This is one of the best wreaths I have ever seen! I would treasure it! I love this wreath. I would love to win it but if not I might try to make one after the holidays! Absolutely love this wreath! Beautiful!!!!! I really love this wreath. It would be so nice on my door. I love it would go good in my home . I love the rag things !!!!! This wreath is beautiful! It would look great on my door and I would love to win it! This is the perfect wreath to PRIMITIZE my front door! I would love to win this wreath. Love the colors!! Love all the great Holiday crafts. Just finished the rag tree skirt & it is awesome. This is so beautiful! I have the perfect place for this! I love this wreath, Gayla. It is simply breathtaking. Merry Christmas to you and your family and staff. This is beautiful……would love to win it to go with my rag decorated tree!! It’s Beautiful!!!! I love it!! I think this wreath would be a perfect addition to my country themed home. My present wreath is looking very worn and sad and really needs to be replaced. Beautiful, would love to own it. Love, Love, Love the wreath. I have made alot with this fabric and getting ready to make curtains for my sons kitchen and dinning room!! I love the wreath it would be beautiful on my front door!! I am making a victorian rag wreath for a christmas present from your 5″ charm packs. I used the pinks and asst. pink and green charms. Turning out pretty nice. I would love to win this and give it to my sister Cami back in Rockford, IL. She lives alone and I think this would really cheer her up. I would make a homespon quilt to go along with it so she could be all cozy this winter while watching TV. It really nice and I’m sure she would love it. Gorgeous!!! What a very generous giveaway–thank you! My home is decorated in mainly country/primitives, and would you believe it…I do not own a single wreath! This would bless my heart and home for the Christmas season. God bless! What a beautiful wreath. I need one like this as its too cold for a living wreath and fake green wreaths look very fake to me…. Love this wreath and everything ragged!!! I absolutely love this wreath. I love the material from my previous order & I will certainly order material from you in the future. Hope you & all the staff of Jublilee have A very Blessed Thanksgiving! Cute wreath, great way to start decorating for the holidays! I love anything that is Rag. This wreath is very nice. I would love to hang it in my house. This is gorgeous and I would LOVE to win it! Such a warm and pretty item to complement the look of Christmas in my Dutch home. I fell in love with it the minute I saw it. What a pretty wreath!! Hope I’m the lucky one!!! This is gorgeous would go great with my christmas tree with my all my ragged oraments. Love this homespun stuff. Have a blessed Thanksgiving. I love these! Thank you so much for providing inspiration for a lovely holiday season. What an adorable wreath. I love the ornie and buttons that were added to the wreath. Would look Great hanging on my door!